The Alchemist’s Heady Topper recently ranked No. 1 out of the top 250 beers in the world by Beer Advocate magazine and at Rate Beer it has a perfect 100 score. 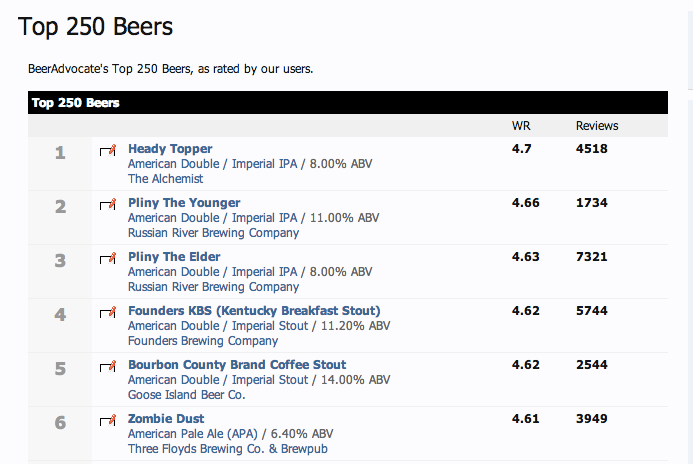 Heady Topper #1 Rated Beer on BeerAdvocate Top 250 Beer List. The hoppy concoction is so popular that sales have grown from 30 barrels a week to 180 a week in the two years since the cannery opened in the outskirts of Waterbury, Vermont. For eight years, Heady Topper was served on tap exclusively at their seven barrel brewpub. In early 2011 they built the Alchemist Cannery, a 15 barrel brewery with an ACS automated Cask canning line, for the production and packaging of their flagship IPA. And now they cannot keep up with demand as they get national acclaim. In September, James Fallows, a national magazine award winning correspondent for The Atlantic, featured The Alchemist in a website article. He took a drive to Vermont to check out their Heady Topper and operations. It is very difficult to buy outside the state of Vermont and the demand for the beer is so high there is a one-case-per-customer limit. The Alchemist owners state that they have been having growth challenges and are currently working on a strategy which they hope to unveil soon. While there, James Fallows got to see their canning system in action and take a case of Heady Topper cans home with him.